Overview - A young man, with the help of his unsuspecting roommates, hikes through the Canadian wilderness in search of Sasquatch. Regarded by some as the "lost View Askew film," 'Drawing Flies' has a pretty problematic history when it comes to releases. Originally produced by 'Clerks' director Kevin Smith back in 1996, the low budget black and white indie flick made the festival rounds but never found theatrical distribution and ended up sitting on a shelf for several years. In 2002, the movie finally received a DVD release, but that disc has since gone out of print, and now, seventeen years after its debut, the film is getting the full Blu-ray Anniversary treatment. But does this oft neglected comedy really deserve a high-def resurgence, or was there a good reason it never made it to screens to begin with? The answer? Well, that depends. Does the prospect of watching Jason Lee dancing with Bigfoot in his underwear sound appealing to you? Don't worry, I'm confused too. Five slacker friends living in Canada struggle to get by without having to work. When one member of the gang, Donner (Jason Lee), has an epiphany, he decides to drag his companions out into the woods for a camping trip. But as the group heads deeper and deeper into the wilderness, Donner's state of mind gradually deteriorates, and his true motivations are slowly revealed. You see, the increasingly unhinged man has no real interest in mere camping. No, his sights are set much higher. He's on a mission to find the ever elusive Bigfoot! The film starts off very much in the vein of something like 'Clerks.' The low budget, black and white style gives it a typical 90s grungy, indie feel, and the comedy is filled with the kind of humorous pop culture philosophizing that defines many flicks of this type. The first act basically focuses on the lazy twenty-something ensemble as they try to con their way into getting welfare and attempt to throw a party to make money. Of course, this plotting is extremely loose, and most of what we get amounts to little more than watching the characters sit around and talk. Thankfully, these sequences can be amusing and though the movie can't help but feel like a less effective riff on 'Clerks,' writer/directors Matthew Gissing and Malcolm Ingram offer a solid approximation of Kevin Smith's trademark dialogue. Once we leave the city behind, however, the film takes a pretty bizarre turn, and things start to get a little... weird. The whole Bigfoot plotline certainly has some potential, but unfortunately, the film never really comes together. The script takes a slightly more serious and dark turn in the third act, and while there are some interesting ideas thrown out about self absorption and the desire to live a different kind of life, these concepts never hit as well as intended. Instead, the movie just starts to feel a bit tedious, and the group's meandering excursion into the woods is disappointingly light on laughs or effective drama. A few overtly odd moments -- like when the gang stumbles upon some kind of weird support group filled with men dressed like babies -- are faintly amusing, but the short runtime just becomes listless. As a whole, the movie has a very "film school" feel with rough visuals and most of the acting is flat, ineffectual, and a bit amateur. With that said, Jason Lee's surprisingly intense performance is fun to watch and that guy in the Sasquatch costume is a clear professional! For several years, 'Drawing Flies' has been almost as hard to get a hold of as Bigfoot himself. But despite its sought after demand from fans, sadly, the flick is pretty mediocre. Though there are definitely worthwhile bits here, the movie's rough style and frequently amateur execution make the film feel more like an unfinished student project than a full-fledged indie. Still, the movie does feature Jason Lee waltzing with Sasquatch and producer Scott Mosier in a diaper –- which is so weird that it's oddly compelling. Sporadically funny and occasionally engaging, this is a problematic yet strangely endearing little film. It's not as effective as other View Askew productions, but fans of Kevin Smith will likely want to check this out. 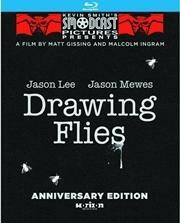 Kino brings 'Drawing Flies' to Blu-ray on a BD-25 disc housed in a keepcase. After some warnings and logos the screen transitions to a standard menu. The movie is provided with a black and white 1080p/AVC MPEG-4 transfer in the 1.66:1 aspect ratio. Shot in 1995 on 16mm with a mostly volunteer crew, 'Drawing Flies' doesn't exactly look too great by traditional standards, but the transfer is seemingly authentic and technically sound. The print source features steady signs of moderate wear with frequent specks, scratches, hairs, and vertical lines. Though clearly visible, these instances of damage don't take away much from the experience, and instead simply add to the gritty, indie spirit of the production. A heavy layer of grain is also present, and there are no signs of unnecessary digital processing or manipulation. Clarity is rather soft and, for a high definition image, a bit indistinct and flat. Fine textures are visible in certain shots, but for the most part the image looks very rough and in some cases the details of the picture faintly mush together. This is also exasperated by the film's blown out white levels which carry an overexposed appearance. Blacks are solid, though shadow delineation is similarly muddy. For all intents and purposes, the movie is really pretty ugly in high definition. With that said, the transfer respects the film's ultra low budget roots and presents a technically strong translation of the source material. This is a gritty black and white indie flick, and as far as I can tell it looks exactly like it's supposed to. It's rough and kind of ugly, but the style suits the material well and the image reflects the inherent nature of the movie's original production and chosen aesthetic. This makes it a little difficult to award the video a traditional star rating, though, so while I think the score given is fair, fans who know what to expect should probably take it with a grain of salt. The film is presented with an English DTS-HD MA Mono track. Like the video, this audio mix is very rough around the edges, but the limited sound does manage to get the job done –- even if there are some notable issues. Dialogue is noticeably muffled and a bit muddled throughout, but thankfully speech remains mostly audible. The entire track has an exceedingly flat quality with limited range. The minimal effects work that is present is adequate and the music comes through decently, but this is about as basic as a mix can get. Likewise, the recording quality of the various elements is definitely rough, and background noise is audible that can sometimes overpower dialogue. Some hissing is also apparent, but doesn't ruin the experience. This track is clearly the result of a low budget production, and while its deficiencies are all understandable, there are times when dialogue is a little hard to make out. Kino has put together a great assortment of special features, including two commentaries with the cast and crew. All of the extras are presented in standard definition with Dolby Digital 2.0 audio and no subtitles (unless noted otherwise). Director Commentary - Directors Matthew Gissing and Malcolm Ingram provide a steady track full of production trivia and amusing anecdotes. The pair discuss the film's sets, locations, song selection, casting, and cameos. They also share some rather candid stories about the movie's festival screenings and troublesome history, and Ingram in particular has no qualms about burning bridges. Cast and Crew Commentary Featuring Kevin Smith - The directors, cast (with the exception of Martin Brooks), and producers Kevin Smith and Scott Mosier sit down for this track. The group joke around a lot while sharing some intermittent trivia, and while not as informative as the previous commentary, it's pretty damn funny. Deleted Scenes and Outtakes (SD, 11 min) – Here we get an sssemblage of a few deleted bits, alternate takes, and clips of the cast goofing around. Stills Gallery (HD) – A gallery of 14 stills and behind-the-scenes photos is included. Original 2002 Introduction with Kevin Smith & Scott Mosier (SD, 5 min) – The producers introduce the film and offer amusing details on its production and release history. New Introduction with Kevin Smith & Jason Mewes (HD, 3 min) – Presented in 1080p with DTS-HD MA 2.0 sound, this is a new intro that features Smith's trademark penchant for entertaining rambling. New Interview with Jason Mewes (HD, 11 min) – Presented in 1080p with DTS-HD MA 2.0 sound, this is an interview with star Jason Mewes. The actor reveals how he got involved with the project, and elaborates on what is was like to shoot in Canada, play a character other than Jay, and work with directors other than Kevin Smith. New Interview with Matt Gissing (HD, 3 min) – Presented in 1080i with DTS-HD MA 2.0 sound, this is an interview with the film's co-director. Gissing comes across as very gracious and seems quite happy that his film is finally getting a proper release. Trailer for Malcolm Ingram's Bear Nation (SD, 3 min) – This is a trailer for Malcolm Ingram's documentary about "bears" -- you know, of the big hairy man variety. Groovy Cartoon Movie Trailer (HD, 3 min) – This is a trailer for the Jay and Silent Bob animated movie. 'Drawing Flies' is an odd, problematic, but still sporadically enjoyable 90s indie effort. The film's slacker comedy can be amusing and its penchant for eccentricity is unique, but the runtime does becomes tedious and the execution is notably amateur. The video and audio are clearly products of the film's low budget, and while seemingly authentic, they are very underwhelming. Thankfully, we get a healthy assortment of interesting supplements. Though hard to find for many years, the film finally gets a proper release and while the movie certainly has issues, fans of View Askew and Kevin Smith will definitely want to check this anniversary disc out.